We have done an excellent job of standing up for Hawaii’s conservation lands and waters! Last Fall, the Department of Land and Natural Resources (DLNR) proposed a suite of regulatory rollbacks in Hawaii’s conservation areas. Hundreds of individuals and organizations stepped up to defend Hawaii’s sacred and significant lands, and the DLNR staff listened. The majority of these rollbacks have been abandoned!! Please make a point to thank the DLNR staff for listening. BUT (there’s always a but), three major loopholes still linger. We need your help right now to halt them. 1. Just add “comprehensive”: by changing definitions and re-structures subsections, the new rules would effectively erase the Third Circuit Court’s ruling in favor of protecting Mauna Kea’s natural and cultural resources through comprehensive management. We can prevent this rollback by asking DLNR to insert the word “comprehensive” into the sections that require management plans for astronomy facilities. This should be extended to include open ocean aquaculture facilities too. With this one word, Hawaii’s land managers could abandon the piecemeal decision-making that has allowed so much of our public trust lands and waters to be sacrificed in the past. And instead embrace truly comprehensive management, where resource protection is the primary purpose of all decision-making. 2. Protective zone is not an energy production zone: The new rules would allow for renewable energy production facilities to be located in the most protected subzone of the conservation district. This makes no sense. We all support renewable energy, but not when it is pitted against the protection of our most fragile wilderness areas. 3. Public oversight on commercial uses: The new rules would take away the requirement that commercial activities in the conservation district undergo a public hearing. There is a lot of opportunity for abuse in these situations. At the very least, commercial use of state (ceded) lands in the conservation district should undergo public hearing and Board approval. Please attend the hearings this week and next (info below) and thank DLNR staff for listening and urge them to close the last loopholes. Paukukalo Community Center, 657 Kaumualii St.
Hawaii County Council Room, 25 Aupuni St.
Mitchell Pauole Center, 90 Ainoa St.
Lihue Library, 4344 Hardy St.
KAHEA: the Hawaiian-Environmental Alliance is a network of thousands of diverse individuals islands-wide and around the world. Together, we work to secure the strongest possible protections for Hawaii’s most ecologically unique and culturally sacred places and resources. In the first week of the 2011 Legislative Session, the priorities for achieving a more sustainable future in Hawai‘i are already apparent. Ending Hawai‘i’s over-dependence on imported food and oil, as well as basic respect for indigenous knowledge and traditional practice as a component of environmental protection dominated the latest meeting of the Environmental Legislative Network (ELN). As the longstanding roundtable of Hawai‘i-based organizations involved in environmental policy, ELN convened this forum at the State Capitol to hear the priorities of more than 20 groups, citizens, and agencies tracking legislation this session. The Sierra Club and the Environmental Caucus of the Hawai‘i Democratic Party highlighted the need for a system to promote and encourage local agriculture. ELN members recognized that respect for indigenous knowledge, cultures and traditional practices is key to sustainable development and proper management of Hawai‘i’s environment. Accordingly, ELN members prioritized proposals that addressed fundamental concerns for the rights of Hawai‘i’s indigenous people. The Office of Hawaiian Affairs identified three environmental priorities, including tightening of the requirements for the sale of state lands; establishing basic training for appointed officials on the rights of Native Hawaiians; and setting minimum requirements for all cultural impact assessments included in environmental impact statements or assessments. Also at the top of the list for legislative initiatives this session were: reducing plastic bags, improving invasive species controls, protecting endangered species, greater shoreline setbacks, and funding for the Climate Change Taskforce. All of the issues presented at the ELN forum are included in the attached summary of legislative priorities. ELN members will be using the new Capitol Watch system as a method of tracking bills and resolutions throughout this legislative session. “We know the legislative process can be opaque to most people,” said Robert Harris of the Sierra Club. “The Capitol Watch is intended to demystify the process so people can follow their passion this legislative session.” The Capitol Watch system is open to the public and available at: http://www.sierraclubhawaii.com/capitol-watch. See attached list “2011 Legislative Priorities,” Hawai‘i Environmental Legislative Network. 1. Remove take restrictions on public hunting of game mammals. This modernizes the game program so that hunters can take more animals for food, and prevents the State from protecting these introduced animals at the expense of native Hawaiian species, essential watersheds, cultural sites, and agricultural lands. 2. Increase funding and identify permanent sources of funding for agricultural inspections at ports of entry and for invasive species control, research, and outreach on each island. Invasive species threaten public health, quality of life, the environment, the culture, watersheds, agriculture, and the economy. 3. Defend the Natural Area Reserve Fund, Land Conservation Fund, and Rental Housing Trust Fund against funding cuts and raids. These funds – supported by the conveyance tax – promote wildlife conservation, watershed protection, land acquisition in the public interest, and affordable housing. – Adequately fund the Invasive Species Committees rapid response teams. – Resolution to improve quarantine inspection system that will minimize the introduction of alien pests, including joint federal-state inspection facilities at ports of entry like Honolulu International Airport and Honolulu Harbor. 2. Ban the use of plastic bags and Styrofoam food containers in Hawai‘i. 3. Establish a 2,000-foot conservation easement coastline setback on all state-owned lands on the Big Island. 1. Reject any proposals that sidetrack or “streamline” the EIS process for any industrial power plant project. Considering the age, impatience and history of the Mainland developer for the proposed industrial wind power plant on Lana’i, it is very possible that Castle & Cooke, DBEDT and other state agencies, will try again to fast-track permit approvals, the EIS review process and/or other oversight provisions for renewable energy projects; e.g., DLNR attempting to change their conservation use district rules. 2. 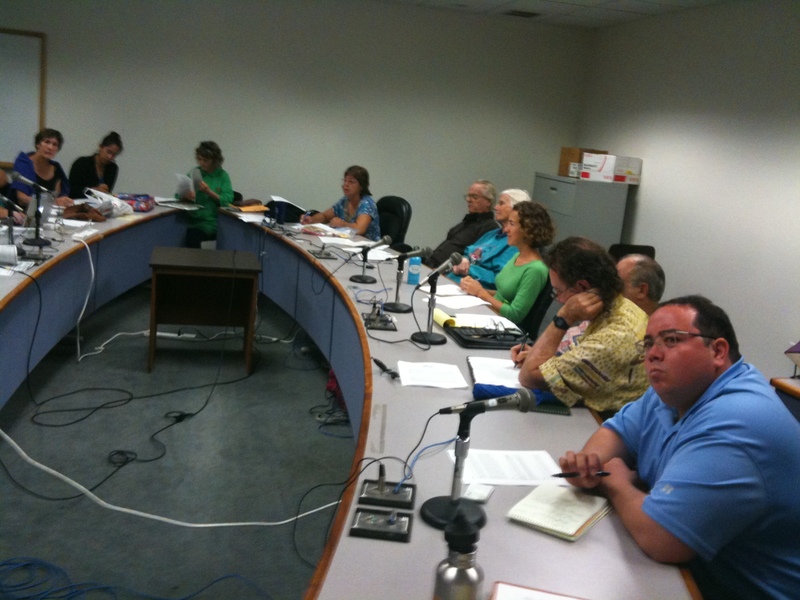 Insure that all public meetings with agendas that could impact Lana’i include at least one meeting on Lana’i. The recently announced list of public meetings for the DLNR’s review of conservation district rule changes includes visits to every island EXCEPT Lana’i. 3. Increase the number of Department of Conservation and Resource Enforcement (DOCARE) officers on Lana’i from one to three. It is impossible for one individual to effectively police this island of 90,000 acres. Defend and build the capacity of community-based stewardship programs to ensure long-term management of natural resources by those who rely on them most. Form public-private partnerships to strengthen pre-kindergarten through post-secondary agricultural education and farm-to-school programs. 1. Promote public access to the beach by establishing a “citizen suit provision,” which would allow individuals to enforce existing public access rights. 2. Encourage the development of sustainable food systems, including proper regulation of open ocean aquaculture and commercial fishing, strict limitations on genetic modification of food, and support for local farmers. 3. Prevent the weakening of Hawai‘i’s environmental review requirements (Haw. Rev. Stat. §343). Improve transparency in public utility rates. After the Public Utilities Commission (PUC) has approved a power purchase contract, the cost figures should be made public. Ratepayers and taxpayers deserve to know how much different sources of electricity cost. Renewable energy companies would gain certainty understanding cost parameters. 1) Healthy Hawai‘i First act: A) Ban any chemical, food additive, ingredient, practice or procedure that will diminish the nutritional value or biological balance of our people’s health, threaten our food supply or resources that we use to grow our food in: water, air, soil. B) Regulate chemical trespass and chemical transformation due to Hawai‘i’s tradewinds and temperatures that exceed 76 degrees. Enforcement funded by fines and food import tax. 2) Sustainable Hawai‘i — Green Reward Incentive tax reduction programs: A) All new building permits must require new buildings or developments to be at least 75% self sustainable. All materials and systems brought into Hawaii must be reused or recycled without additional cost to the State or Counties. B) Upgrade State and County power generation infrastructure; C) Make these green systems available to the public for residential infrastructure reduction thru a mass purchasing facility (State Sustainability Depot). 3) Food Sustainability: A) Encourage backyard gardens — lessening the need to import food items and encouraging the consumption of food with higher nutritional values. B) Establish organic agricultural parks to support farmer success. Housing must be made available to the farming families on part of the land in a residential complex away from the fields. Funded by food import tax and 10% of food sales. 1. Establish a private attorney general right of action to impose penalties for violation of the burial protection laws and to clarify the breadth of available legal remedies to protect ancient Hawaiian burials from desecration by development. 2. Demand greater accountability for the production of homestead awards and begin to make adequate funding available to the DHHL, starting with an appropriation to pay for the installation of a water system to support pastoral homesteading at Honoka‘a. 3. Appointment of a cultural monitor to oversee and report on the implementation of programs to recognize and respect the ability of native Hawaiian prisoners in private prisons on the continent to observe religious/cultural practices while incarcerated without interference from prison officials. 1. Remedy the inconsistent quality of cultural impact assessments (CIAs) by codifying minimum requirements for assessing the impacts of a proposal on cultural practices; names OHA as the accepting authority for CIAs. 2. Require all council, board, and commission members that have an obligation to protect Native Hawaiian traditional and customary rights and related resources to attend a training course on their public trust responsibilities to Native Hawaiians. 3. Amendments to laws regulating the sale of state-controlled land to better enable decision-makers to assess the proposed sales and determine whether or not the lands were part of the public lands of the Kingdom of Hawai‘i or not. 1. Pursue adequate state funding for the recovery of Hawai‘i’s 439 endangered species with focus on Hawai‘i State being out of compliance with ESA and MMPA laws for the critically endangered Hawaiian monk seal (ie. Gillnets and no required mitigation plan). Urgent need for funding for seal outreach and education for resident & visitor population. 2. Ban on Hawai‘i’s reef wildlife taking for sale by the international aquarium trade. Strong focus on endemic Hawaiian species for sale in this novelty industry. Encourage sustainable open ocean aquaculture by establishing minimum requirements for all open ocean aquaculture operations in state waters. 1. Establish food sustainability standards that lay out Hawai‘i’s vision for the amount of local food it will produce and create metrics to determine our success in achieving these goals. Our state policy should encourage growing pono and eating ono. 2. Continue to reduce Hawai‘i’s opala (waste) addiction by reducing the number of paper and plastic bags sold, requiring recycling of CFL bulbs, and creating a mandatory “opt-in” requirement for the distribution of telephone books. 3. Require the use of native plants in public landscaping to ensure our government takes a leadership role in protecting indigenous plant species throughout Hawai‘i. 2. Create a pilot program to promote water recycling and the re-use of gray water (from washers, showers and non-kitchen sinks) for 10% of Hawai‘i’s homeowners, saving money for individual owners and the counties by reducing the amount of water going into our wastewater treatment plants. 3. Create an initiative that offers qualified homeowners low-interest loans and/or tax incentives to upgrade from cesspools to septic tanks to reduce leaching sewage and water pollution, especially in rural and coastal lands. 4. Establish a 2000-foot shoreline setback on all Big Island state land from Ulupo Point to Volcanoes National Park to protect the historic Ala Kahakai Trail and preserve public access to the coast. 2. Promote environmental education in schools. 1. Defend the Natural Area Reserve Fund, Land Conservation Fund, and Rental Housing Trust Fund against funding cuts and raids. These funds – supported by the conveyance tax – promote wildlife conservation, watershed protection, land acquisition in the public interest, and affordable housing. 3. Support planning and resilience in our natural and constructed infrastructure to the effects of climate change. Ultimately, a small portion of the barrel fee (5-10%) should go to addressing the inevitable effects of climate change caused by burning fossil fuels. A good start would be to actually fund and organize the Climate Change Task Force created by the Legislature. Defend the Natural Area Reserve Fund, Land Conservation Fund, and Rental Housing Trust Fund against funding cuts and raids. These funds – supported by the conveyance tax – promote wildlife conservation, watershed protection, land acquisition in the public interest, and affordable housing. Support improvements to the outdated partial public funding program by supporting the Big Island public funding pilot program, which gives county council candidates the chance to qualify for a competitive amount of money to run for office. 1. Re-establish the CLIMATE CHANGE TASK FORCE – ACT 20 Special Session 2009 whose funding was never released by Governor Linda Lingle after her veto was over-ridden. Thus, its objectives – to identify current & potential impacts of global warming & sea level rise, to estimate the costs to mitigate damages caused by them & to suggest legislative & administrative policy changes primarily at county & state levels – were never carried out. 2. Create a temporary task force comprised of representatives from state & county public agencies, private sector businesses, non-governmental organizations, academic researchers, legal experts, and legislators to examine and evaluate Chapter 205 – Land Use Commission to identify sections which need legislative modifications reflecting 21st century social, cultural, environmental & economic shifts in policies & standards – especially section 205-17 – Land use commission decision-making criteria. 3. Establish a voluntary tax refund check-off fund ($3 to $5 per refund check) to provide additional financial support for the Natural Area Reserve Fund, the Land Conservation Fund, and Rental Housing Trust Fund. Hawai`i taxpayers already have set up similar check-offs for domestic violence programs, school repairs & maintenance, publicly-funded elections, and the state library system. After sitting through four days of testimony from Tropic Land, the developer proposing to industrialize farmland at the back of Lualualei Valley, last week the Concerned Elders of Wai‘anae finally got their chance to say their peace. In just a day and a half, the Elders presented 9 witnesses, 5 of them experts. They all testified to the immense cultural significance of this area and the inadequacy of the cultural impact assessment conducted for this property, they testified to the rural nature of this community and how 500 more vehicles an hour on these roads would cripple their traffic system, they also testified to the history of farming on this exact spot, the tendency of this area to flood, and how poor the soil is for building on. Professor Puakea Nogelmeier, Eric Enos and Emil Wolfgramm schooled the developer and the Commission on the cultural significance of landscape to Native Hawaiian cultural practice and the importance of the demigod Maui to Wai‘anae and all of the Pacific. The industrial park is proposed for construction on the shoulder of Maui’s profile in the Wai‘anae mountain range. Professor Jonathan Deenik, Gary Enos, and Walterbea Aldeguar demonstrated how this land is good for farming and bad for urbanization. The developer’s attorney actually tried again with that giant orange bucket of dirt. But it didn’t work. They all agreed, yes, even with rocks like that, this land can grow food — good food! And Aunties Alice Greenwood, Lori Nordlum and Elizabeth Stack offered the Commission a unique perspective into the history of this land and this community with their stories about Hakimo Road, the old railroad that would have to be moved to make way for the industrial park, and farming in their backyards. It was a great showing for Wai‘anae! Eo Wai‘anae!! The next hearing is tentatively scheduled for February 2nd, 9 am at 235 S. Beretania St., 4th Floor. This should be an exciting hearing. We hope to finally hear the much-anticipated testimony of Hanalei Aipoalani, the author of the Cultural Impact Assessment for this project. Unfortunately, he has not been available to testify at previous hearings. We may also hear again from Project Manager for this proposal, Arick Yanagihara, and for the first time from their consultant, Aunty Roberta Ulu Searle. The Land Use Commission is expected to make a decision in this case in the Spring. Relatedly, the City’s Planning Commission is expected to hear public testimony on the Wai‘anae Sustainable Communities Plan on February 16, 2011 in Kapolei. A purple industrial spot was inserted on the land use map in this plan specifically to allow for Tropic Land’s industrial park, even though there was never community consensus for the project. People concerned about the loss of agricultural lands in Wai‘anae should attend the Planning Commission’s hearing on the Wai‘anae Sustainable Communities Plan — because if approved, this purple spot would be on the community’s plan for a very long time, whether or not Tropic Land is granted permission to build. “Community comes to the defense of Lualualei Valley’s ag land,” The Hawaii Independent, January 11, 2010. KAHEA joined a coalition of environmental, conservation, and ocean user groups in appealing the decision of the Honolulu Department of Planning and Permitting to allow Kyo-Ya, the owner of the Moana Surfrider Hotel, to build a massive luxury hotel on the beach at Waikiki. Kyo-ya proposes to knock down the 8-story building (that should not be built there) and build a new huge 26-story, surfboard-shaped, luxury hotel and condo structure right next to the historic Moana Banyan Tree Court and the Kuhio Beach Park (the only public park on Waikiki beach). Such a proposal is not allowed by the many laws passed over the years to protect Oahu’s shorelines, especially Waikiki Beach. Despite these protections, the City approved Kyo-ya’s proposal. – it will weaken the overall efficacy of the laws we established to protect our best interests because the City felt like exempting the hotel from the no-build zone on Waikiki. That’s why we are appealing the decision to the Zoning Board of Appeals. “Coalition fights to keep Waikiki developer Kyo-Ya from bending the rules,” The Hawaii Independent, Jan. 6, 2011. Appeal filed to the Zoning Board of Appeals, Dec. 28, 2010. Testimony from Jim Albertini in opposition to the TMT. Mahalo Uncle Jim for coming to the meeting and sharing your mana‘o! The TMT project has the same smell as the fast track DLNR plan years back to put geothermal development in the Natural Area Reserve Conservation district known as the Wao kele O Puna Rainforest –the last remaining intact lowland rainforest in Hawaii. That misguided effort resulted in hundreds of arrests for non-violent civil resistance and was stopped over the failure to do a Federal EIS. The same may be required for the TMT. Federal funds are involved and no Federal EIS has been done. Our non-profit organization, Malu Aina Center for Non-violent Education & Action, grows food to share with people in need and to support the work of justice, peace, and preserving the environment. We stand in strong opposition to the Conservation District Use Permit requested for the Thirty Meter Telescope on sacred Mauna Kea. We recommend that the Board deny the permit request for the following reasons. The current state of Mauna Kea represents a microcosm of our planet heading off the cliff of Global Warming due to over-development. For our planet, the evidence is crystal clear that the present course of industrial development is heading for unprecedented catastrophe. But are we willing to seriously change the way we live, and the decisions we make day to day. Are we willing to put conservation before development? 1. We know that the cumulative impacts on Mauna Kea according to the 2005 EIS done by NASA are “substantial, adverse and significant” yet we still go forward with more building: 5 meter telescopes, 10 meters, now 30 meters, with no end in sight. The “bigger is better” logic will eventually put a mirror over the entire summit. 2. We know that No study has been done to assess the carrying capacity of the mountain for development. 3. We know that the University of Hawaii and its self appointed Mauna Kea Management Board are in a position of conflict of interest. The University benefits financially from telescope development yet it is suppose to be a management entity for conservation on the mountain. The record is clear: development trumps conservation. When will we learn? When will we reverse course and put conservation before development? For our organization the bottom line is this. The host culture of Hawaii tells us that the summit of Mauna Kea is the most sacred temple in all Hawaii. In fact, Mauna Kea and Mauna Loa are two of the most sacred sites in all the Pacific. Do we simply hear those words but have no understanding of their meaning? Or do we understand but disregard the meaning out of other concerns –science, prestige, development money and jobs? In any case, to proceed with further development in the summit area of Mauna Kea is desecration of the most sacred temple in Hawaii. It is disrespectful. It is shameful. In the Judeo/Christian sense, it is sacrilegious. It is sinful. The irony is that looking into the heavens will be our downfall because we have not shown respect. We look into space but not listen to the native people of this place. If we want to be pono, the means we use must be in line with the end that we seek. It is time to live aloha — live the principles of non-violence in Hawaii and around the world. Aloha demands justice. The conflict over expanding construction on Mauna Kea, like the expansion of militarism and warfare training at Pohakuloa represent sores/infections on the ‘aina. They are symptoms of a deeper problem. What is truly needed to heal is to end the ongoing illegal U.S. Occupation of Hawaii. I am confident that a reinstated independent nation of Hawaii would never permit the desecration of its most sacred temple. Deny this permit request. Mahalo. Purple Spot Update: What does the bucket of dirt prove? The Hawaii Land Use Commission is considering whether to allow an industrial park on farmland in Lualualei Valley. The contested case hearing process for this decision is currently underway. We just completed the second set of two-day hearings, where the developer introduced a bucket of dirt. Why? What does the bucket of dirt prove? Attorney (standing over open bucket of dirt, pulls out a rock): Can you farm dirt with rocks like this? All that intrigue over the mysterious bucket of dirt and what did we learn? That things aren’t always what people tell you they are. Just because the developer says this land is not fit for farming, doesn’t make it true and it doesn’t justify turning that land into an industrial park. Likewise, just because the developer says there is no known cultural significance or environmental health issues or traffic problems… doesn’t make it true. 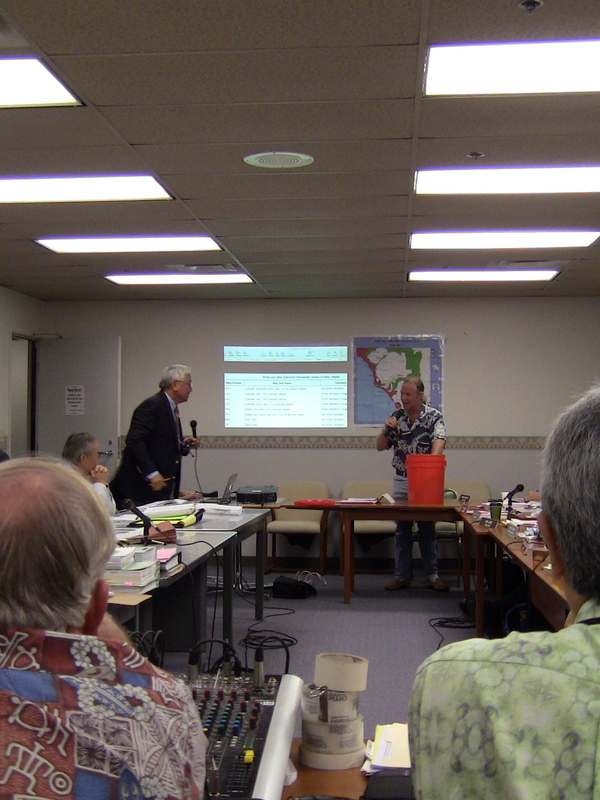 With just a few pointed questions, we learned that the traffic impact analysis actually isn’t adequate, the air quality and run-off studies are not relevant to Lualualei Valley, and archeological survey hasn’t been updated since 1993. The Concerned Elders of Waianae are preparing now to present their side of the case on January 6 and 7th. If you are interested in providing public testimony, please join us at 9 am on January 6th and the LUC offices in Honolulu (235 Beretania St. #405). “They (UH) can say Malama Aina but I don’t believe it. Look at what has been done to the mountain in the name of astronomy.” -Kiope Raymond, Kilakila O Haleakala. “If all the telescopes go away, it would be no loss for me as an astronomer. I would simply go to where the telescopes are.” -Paul Coleman, UH Astronomer. Kilakila O Haleakala has already filed suit for the lack of an environmental impact statement on the University’s management plan for the summit of Haleakala and requested a contested case hearing on the construction permit. A proposed solar telescope atop Maui’s Haleakala Volcano will be built despite Native Hawaiian opposition and an environmental report showing the project would have major cultural impacts. The Hawaii Board of Land and Natural Resources on Wednesday approved a Conservation District Use Permit for theAdvanced Technology Solar Telescope. The permit is a critical, if not final, step in the decades-long discussion to build such a device. Opponents could still appeal the decision. When completed in about seven years, the new building will join a half-dozen scopes at the 18-acre Haleakala High Altitude Observatories Site, known by many simply as “Science City.” Some testifying Wednesday said their access to the mountaintop — which Native Hawaiians consider sacred — is already restricted and complained that stewardship for the area has been sorely lacking. Astrophysicists from the University of Hawaii argued the new telescope will be a boon to Hawaii’s scientific community, will benefit students, will create jobs and boost the local economy. They also said that the research is important for humanity as a whole, and that Maui was selected by the international community to be the optimal location for the ATST. Not to be confused with the controversial Thirty Meter Telescope(“TMT”) project proposed for Mauna Kea on the Big Island that will study stars throughout the Milky Way and other galaxies, the ATST hopes to determine how cosmic magnetic fields are generated and destroyed by looking closely at just one star — our sun. “This is about understanding the interior of the sun and how it works,” Jeff Kuhn, a solar astronomer with the University of Hawaii’s Institute for Astronomy, said at the meeting Wednesday. He said the device would help measure solar flares and changes in the sun’s temperature that, while small compared to immense heat of the sun, could impact life on earth. It’s impossible to stop hurricanes, but it’s still nice to know when they’re coming, Kuhn said. The research that will be possible with the new telescope could help humans in much the same way. But Native Hawaiians reiterated their opposition to the proposal. They say Haleakala is sacred and should not be desecrated with further development, even for scientific research. They complain that the university hasn’t adequately maintained the area since it took control decades ago. And they say they want access to view planes and other culturally important sites. Kiope Raymond is a professor at Maui Community College, part of the University of Hawaii system that was seeking the permit. But his area of study is Hawaiian language and Hawaiian studies, not astronomy, and as president of theKilakila O Haleakala nonprofit organization, he has spoken in opposition to the proposal. At Wednesday’s meeting, after retelling the legend of the demigod Maui snaring the sun at Haleakala, Raymond tearfully said that he had had a spiritual epiphany at Haleakala. He asked board members to vote no. The Final Environmental Impact Statement prepared for the project acknowledges that the construction and day-to-day use of the ATST “would be seen as culturally insensitive and disturb traditional cultural practices,” causing a “major, adverse, long-term impact” to cultural, historic and archeological resources. A schematic design [pdf] submitted by the applicant in November shows the building housing the telescope will be more than 100 feet high and will need to burrow about 30 feet down into the volcanic rock. The National Solar Observatory, which manages the ATST, previously estimated that the project would cost an estimated $175 million to construct. Prior to Wednesday’s meeting, David Kimo Frankel of the Native Hawaiian Legal Corporation had already filed a request for a contested case hearing, which would allow both sides to argue in a quasi-judicial setting. Frankel said the board was required to grant the request and hold the hearing before making its decision. Department of Land and Natural Resources Director Laura Thielen, likely in her last meeting as board chair, conferred with a deputy attorney general in a 30-minute executive session and decided to ignore the request. A contested case hearing or appeal in the court system is still a possibility after the board’s vote, which is why the approval may not be the final OK the telescope needs from the state government. Before the vote, Thielen added language requiring the University of Hawaii to report back to the Land Board each year with a list of any additional mitigation methods suggested by a Native Hawaiian Working Group, along with the results of those suggestions. She said it was a good model for future projects the board handles after she’s gone. William Aila Jr., currently the Waianae harbormaster and governor-elect Neil Abercrombie‘s pick to head up DLNR, arrived at the board meeting during the telescope discussion Wednesday but did not testify or otherwise voice any opinion. Aila, a Native Hawaiian, has supported some indigenous causes — for example, he has opposed military live-fire training in Makua Valley. Four other members joined Thielen in voting to approve the permit. Among those in favor was Maui board member Jerry Edlao, who said it was a difficult decision. The lone vote in opposition came from Samuel Gon, a scientist and cultural advisor with The Nature Conservancy and an at-large member of the board. Earlier Wednesday, the Land Board unanimously approved a related item establishing a comprehensive management plan [pdf] for astronomy atop Haleakala. DISCUSSION: Did the Land Board err in allowing the solar telescope to move forward on Haleakala? Join the conversation. If you’re not a Civil Beat member, you can click here to get $5.00 off your first month’s membership. Copyright 2010 Peer News LLC. All rights reserved. You are granted permission to share this content with people personally known to you by email only. Posting this content to the Internet in any form or using this content for commercial purposes is prohibited, except as permitted by the Fair Use doctrine of copyright law.